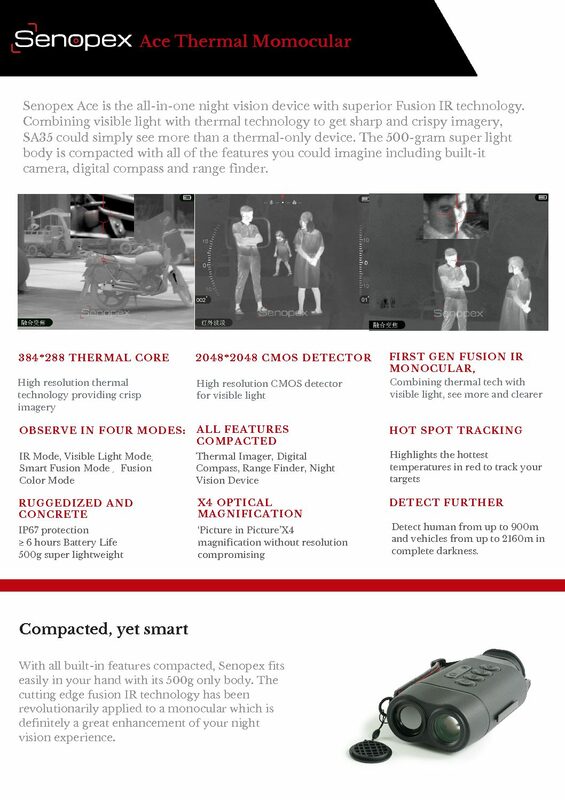 A Thermal Imager, a low light night vision device, a digital compass, a Range Finder, a thermal camera and the first generation FUSION IR IMAGER, Senopex Ace Monocular acquires the very best technologies in one device to provide high-precision target detection. Smart Fusion Mode and Fusion Color Mode. Switch any time to join a simply clearer Fusion IR world. With 500g ultra lightweight body, IP67 protection level and 6 hours’ battery life, Senopex Ace can detect man from up to 900m and vehicles from up to 2160m away.